AIDS STIFF JOINTS ActivEase® Green Lipped Mussel from the crystal clear waters of New Zealand provides a guaranteed, super-concentrated source of Omega 3 fatty acids, which aid the natural anti-inflammatory action of the cat's metabolism to sooth stiff joints. SUPPORTS JOINT STRUCTURE Glucosamine provides the major building blocks of cartilage – the tough connective tissue that protects the joint. Natural Chondroitin from Green Lipped Mussel maintains healthy joint structure. Manganese supports collagen formation in the cartilage, tendons and ligaments. PROMOTES MOBILITY Hyaluronic Acid is a major part of synovial fluid, which helps lubricate and cushion the joint. Natural antioxidant Vitamin E neutralises free radicals, helping to maintain joint mobility. Sourcing and strength make all the difference – ActivEase® Green Lipped Mussel contains 4x more active Omega 3 than standard versions. Lintbells’ ActivEase® Green Lipped Mussel is sustainably farmed in the clear blue coastal waters of New Zealand, then carefully harvested and cold vacuum extracted for the highest possible natural quality. That's why ActivEase® Green Lipped Mussel contains 4 times more active ingredients than most other versions. For an average 4-5kg cat, use one capsule per day. It’s easy to feed – just split the capsule and sprinkle over your cat’s food. 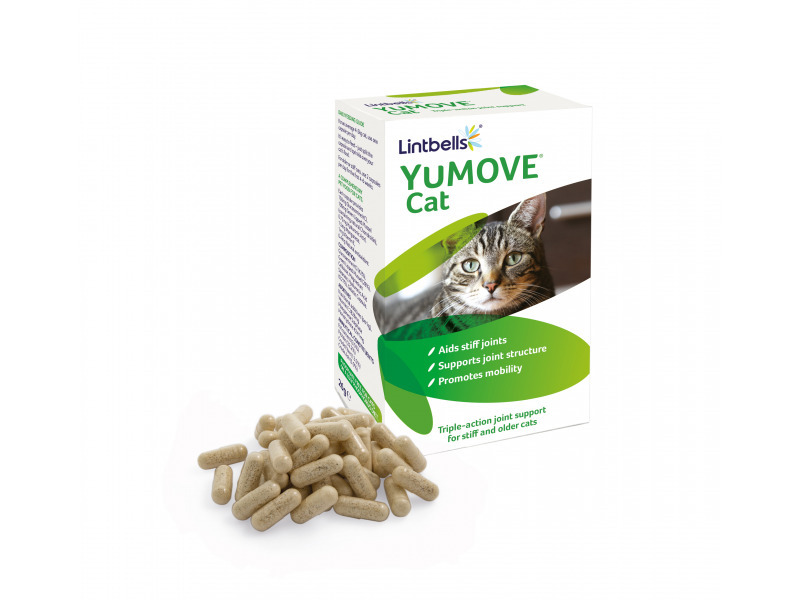 Below are some recent questions we've received regarding YuMOVE Joint Supplement for Cats, including answers from our team. Is it alright to empty the capsule contents onto food? My elderly cat does not take pills easily, or at all! Can the capsules be given whole. I have a fussy eater but giving pills is no problem. Yes, the capsules are made from gelatin so they are digestible. Hi. I have a cat who is a year old. He has bad confirmation in that his back leg joints nearly touch. He sometimes struggles to jump up and has been to vet and had mild hip pain. Just looking for something to give him a boost. Your cat might well benefit from Yumove. Usually it has to be given for a few weeks before any improvement is evident. It is worth asking your vet if joint supplements might be of benefit, though any conformational defect can result in joint discomfort in time, so this sounds like a sensible measure to take. Is this safe for my 19 year old cat to take? She takes 20mg of Vidalta a day for hyperthyroidism. Yumove products are very safe and this should be fine for your cat. However at 19 years old any change or addition to the diet is best introduced gradually, while you monitor how things are going. It should not have any sort of interaction with Vidalta. Is this product ok to use in renal failure cats? Theoretically this product should be fine to give to cats with reduced kidney function. My only concern would be that if your cat does not like the flavour and you mix it into food, you might put your cat off eating, which would be a bad thing. However many cats enjoy Yumove and then it is not a problem at all. Yes this should be perfect for your cat and is often combined with Metacam.